Everybody gather around, it’s time for some limited DLC. To celebrate the launch of LittleBigPlanet 2, MediaMolecule is offering up some very limited DLC for one week only. Sure it’s likely a ‘reward’ for preordering or buying the game early, but it’s got a little quirk to go with it. 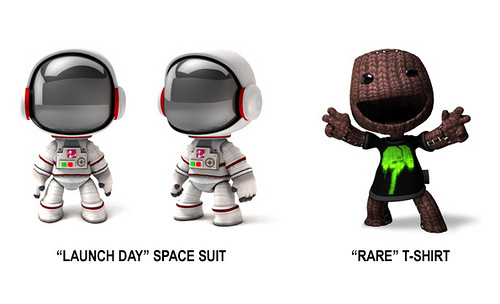 The two available items are a “rare” Tee-shirt for Sackboy at $4.99, and the “Launch day” Spacesuit - which was the exact same (free) spacesuit from the first LittleBigPlanet that was only available for a limited time. I highly recommend you at least check your PS3 if you have plans to purchase LittleBigPlanet2 down the road. We really like it in co-op. DC Premium DLC Coming to LittleBigPlanet 2! Page created in 0.4638 seconds.